Overweight and obese people may see improved insulin sensitivity with a higher-protein diet, depending on whether they have a particular genetic variation related to vitamin D metabolism, according to a new study published in Diabetologia (the journal of the European Association for the Study of Diabetes). Approximately 86 million people in the United States, or roughly one in three adults, is living with prediabetes, putting them at increased risk of developing Type 2 diabetes. Vitamin D has a variety of jobs in the body, ranging from helping maintain strong bones to helping muscles move and nerves transmit messages. Previous research has indicated that low levels of this vitamin are linked to obesity and insulin resistance (a condition in which the body does not use insulin effectively) and are associated with an increased risk of Type 2 diabetes. Foods high in protein and fat, such as fatty fish, eggs, nuts, and cheese, are the main dietary sources of vitamin D.
To determine whether the nutrient content of various weight-loss diets interacts with genes related to vitamin D metabolism to affect body weight and insulin resistance, researchers analyzed data from 732 overweight and obese adults who followed one of four reduced-calorie diets as part of the two-year POUNDS Lost study. Two of the diets were high-protein (25% of daily calories) while two were low-protein (15% of daily calories), and two of the diets were high-fat (40% of daily calories while two were low-fat (20% of daily calories). All of the diets worked equally well for weight loss, helping participants lose an average of 8 to 10 pounds, with no apparent differences based on genetic variations in vitamin D metabolism. Gene variations did appear to play a role, however, in the participants’ metabolic response to the diets: People with what is known as the DHCR7 variant (which helps the body make vitamin D, leading to increased levels) showed greater decreases in insulin resistance and fasting insulin levels in response to the high-protein diets, but not the low-protein diets. 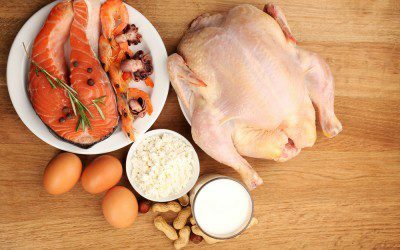 No significant interactions were found with either of the other two genetic variations tested and dietary protein or with any of the genetic variations and dietary fat. “Our findings of gene-protein dietary interaction are biologically plausible, provide additional evidence for the roles of vitamin D in insulin resistance, and suggest new insights into effective strategies for Type 2 diabetes prevention and intervention,” the researchers state. However, the authors do note that the study had a number of limitations, including that it did not measure the participants’ blood levels of vitamin D and that 80% of participants were white, and that the findings are not currently practically useful because people do not know the genetics behind their vitamin D metabolism. “It is possible that this will help us individualize dietary (diabetes prevention) interventions in the future. We hope to test this, but it is still at the concept phase at the moment,” said lead researcher Qibin Qi, PhD. For more information, read the article “High-Protein Diet Offsets Certain Genetic Risk for Diabetes” or see the study’s abstract in the journal Diabetologia. And to learn more about improving blood sugar control, see the piece “Managing Hyperglycemia,” by certified diabetes educators Laura Hieronymus and Belinda O’Connell.